The FaithWorks’ Open Doors program is restoring much more than houses. It is also restoring the lives of homeless people here in the Golden Isles, one renovated house at a time. The program does this in two ways — by hiring homeless individuals to restore properties and by allowing homeless people to rent them when complete. 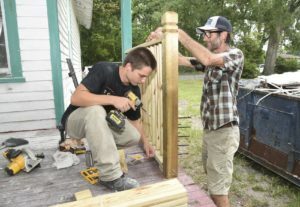 The Open Doors crew’s first project was renovating a property on Reynolds Street in Brunswick. It is now working on its second property on Lincoln Street. The project began July 12 with a 12-week completion schedule to get the house ready for sale or rent. The new property is approximately 1,450 square feet. It will be two different units with two different entrances. “Our goal is to get two families, or two separate entities, in either unit,” said Ron Slade, who leads the Open Doors program. For this project, the crew will be doing basic demolition and debris removal, refinishing the hardwood floors, painting the house and plastering damaged walls. Open Doors works entirely on community donations and grants. The St. Marys United Methodist Church Foundation granted FaithWorks $75,000, and pledged another $50,000 if FaithWorks raised the same amount…. For the rest of the story, please click on the link below.